Our first concert season began in march 2017. 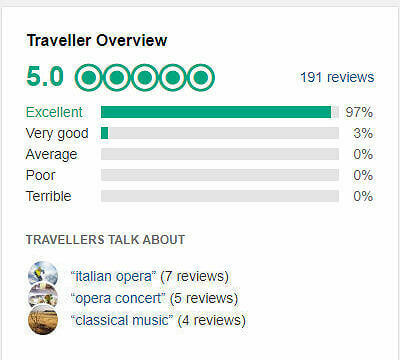 Since then we gained a substantial reputation as the only professional season of concerts for tourists in Rome. We are very keen on offering our audience quality performances, so we pay much attention on building a highly selected team of performers who enjoy making music and being ambassadors of the old Italian art of singing, the so called Belcanto. 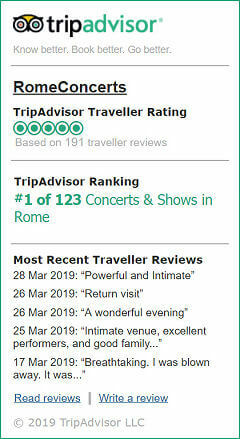 Reviewing RomeConcerts (on TripAdvisor, Google, Facebook, etc.) helps us to be more widely known and to understand what in our season is already at the top and what can be improved. It is the appreciation of the audiences in the years that allows music, written even centuries ago, to be still performed and to live in the heart of people.